Open die forging is the process of deforming a piece of metal between multiple dies that do not completely enclose the material. The metal is altered as the dies “hammer” or “stamp” the material through a series of movements until the desired shape is achieved. Products formed through open forging often need secondary machining and refining to achieve the tolerances required for the finished specifications. Open die forging is widely used for the products in small quantity that are simple, rather than complex, such as discs, rings, sleeves, cylinders and shafts. Custom shapes can also be produced with open die forging. The strength of the grain structure will be increased during the deformation process due to the repeated working of the steel billet. Another benefit of open die forging is that the fatigue resistance and strength of products will be improved. Besides, voids could be effectively reduced after open die forging. Closed die forging (also known as as impression die forging) is a metal forming process that compress a piece of metal under high pressure to fill an enclosed die impression. For some special shapes, second forging operation is required to reach final shapes and dimensions. The type of material, tightness of tolerances, and need for heat treatment can determine the cost of a closed die forged part. Open die forging is also called free forging. In open die forging, the billet is placed between multiple dies that do not enclose the metal entirely. The dimensions will be changed by hammering and stamping the metal through a series of movement until the final dimensions are achieved. Closed die forging process, is also referred to as impression die forging. It utilizes high pressure to compress the metal piece to fill an enclosed die impression for required shapes. A medium frequency induction heating furnace is used to heat the metal for pressing into dies. 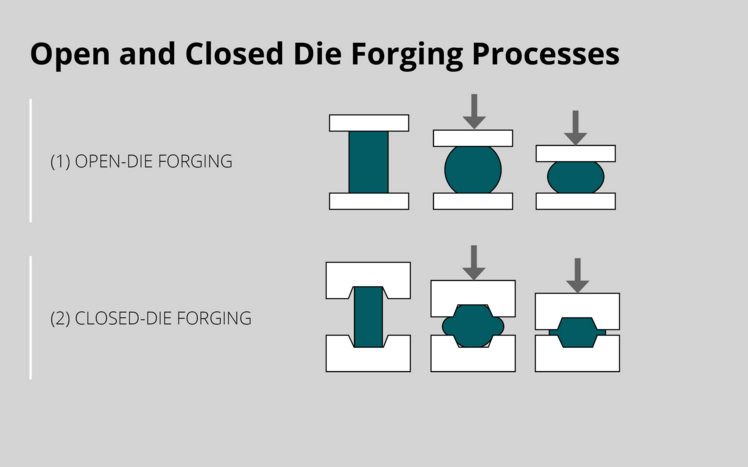 The technique of both open die forging and closed die forging is different. In general, for closed die forging, the molding dies are first precision machined and cost is high. The metal bars are then placed on between upper and lower dies and forged to any shapes needed. After closed die forging very less or no machining will be operated due to its high accuracy throughout the process. So closed die forging is also a net shape or near net shape process. For open die forging, enormous compressive forces are imposed by the continuous strike of a forging hammer to deform the metal billets. Unlike closed die forging, dies of open die forging is very simple. And secondly machining operation is always carried out. Better fatigue resistance and improved microstructure The internal grain structure formation increases the tightness and strength of the products. Continuous grain flow and finer grain size Economic for large production runs. Closed die forging and open die casting are the most common used forging methods for steel parts. Forging is popular because of its improved internal grain structure and can produce stronger and tougher products. In Open die forging, a rough or precision machining is normally further required after the open die forging process as imprecise dimensions are achieved by hammering. Thus, open die forging is more suitable for large parts in a number of tons. Generally, the products in forging method include forged long shafts, forged rollers, and forged cylinders, which are mostly used for the application of railway and aircraft industry. However, closed die forging is preferred for small critical parts with safety consideration because of its high precision. It is highly used to produce small products like forged fittings, forged lifting & rigging hardware, forged automotive parts, etc. Oilfield, automotive, forestry & agriculture, and mining are some of the industries that rely on closed die forging technique. Fly Forge is the professional closed die forging company for small steel forgings in Ningbo, China. Open die forging could also be sourced from our company if needed. Forging china is really cost saving for our customers!